Grundfos is one of the world's largest manufacturers of pumps, providing water for homes, farms, commercial buildings, and industrial uses. Itï¿½s their mission to successfully develop, produce and sell high-quality pumps and pumping systems world-wide. Grundfos contributes to a better quality of life and healthy environments. 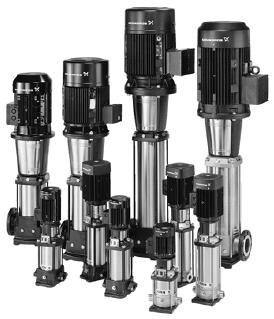 Grundfos pumps feature unique stainless steel construction, the latest in electronics and are recognized for reliability and value throughout the world. Grundfos offers a variety of commercial and industrial pumps for handling hot and cold water and other fluids in light industrial, process and residential applications. Grundfos three major product groups are circulator pumps (UP), submersible pumps (SP), and centrifugal pumps (CR). 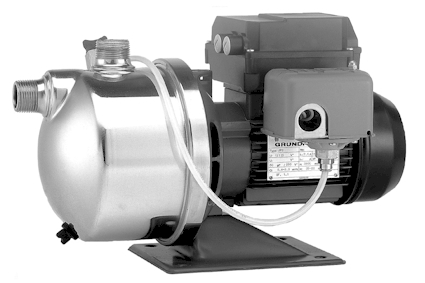 Today, Grundfos is the world's largest manufacturer of circulator pumps, covering approximately 50 per cent of the world market for these pumps. Stellar Efficiency! The markedly lower electricity consumption of the new CR pumps increases your efficiency and makes the investment in a new pump worthwhile! The new Grundfos CR series offers the highest efficiency of any multi-stage centrifugal pumps in the world. A considerable advantage to the operating efficiency of large pumps. The results are attributable to Grundfos' unique hydraulic design and the new production techniques. Servicing? It is rarely necessary. When it is, the process is straightforward and without the need for special tools. The Basic Concept of Instant Hot Water Recirculator Pumps Every homeowner gets frustrated waiting for hot water supply -- but how many stop to think what happens to the 2-3 gallons of waste water that runs down the drain during the wait for the source water to get hot? Those gallons of water are wasted, and in an average household that takes four showers per day, that can add up to thousands of gallons per year. Multiplied over a subdivision of 300 homes, a community can have millions of gallons of drinking water go down the drain and into the wastewater system every single year. In a region where home water conservation issues are rising in importance with a rapidly expanding population, and a record economic expansion that has consumers looking for comfort, Hot Water Recirculation pumps -- such as those manufactured by Grundfos Pumps Corporation -- are a good solution to this problem. In typical plumbing, city water or well water is pumped from the water heater through the pipes to the tap. Once the tap is shut off, the water supply remaining in the pipes cools -- hence the familiar wait for hot water the next time the tap is opened. Grundfos instant hot water recirculator pumps offer a solution to the problem by attaching to the water heater through the hot water pipe. By constantly circulating hot water through the pipes from the instant hot water pump at the heater to the furthest fixture, the water in the pipes is always hot, and no water is wasted during the wait. In an average new home, HWR systems typically cost less than $1,000, including parts and installation. The Grundfos JPS water pumps are low cost jet pumps designed for residential and light commercial applications. The inital purchase cost is lower than other pumps in the Grundfos line, but the JPS still has the quality to earn the Grundfos name. This pump is designed for intermittent use and not 24 hour continous duty like the CHI and CRN series pumps. The Grundfos MQ is a compact all-in-one pressure boosting unit, designed for domestic water supply and other boosting or lift applications. The MQ is a compact and reliable, easy-to-install pump, with many standard features. 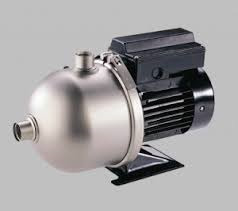 The MQ is a self-priming multistage centrifugal pump. It self-primes from a well depth of down to 25 feet within a maximum time of 5 minutes. The MQ pump is also ideal for pressure boosting from water storage tanks or from city water supply (maximum 45 psi inlet pressure). The Mark III MQ pump offers many upgrade features over the second generation whole house booster pump. Improved electronics, more durable motor, better circuit boards and more. One key improvment on the Mark III pump is the optional environmental cover that makes the pump UL rated for outdoor installation. This is critical for those of you who intend to install your booster pump where it may be exposed to the elements. << Click! Selection Guide, Find Your Model If your problem is low water pressure, Grundfos EZ Boost is your solution. Grundfos EZ Boost provides constant water pressure – even while multiple taps are on, and is perfect for large residential & light commercial pressure boosting applications. Its high-quality construction and rugged design ensures low-maintenance and trouble free operation. EZ Boost can be installed just about anywhere; it is simple to install and simple to operate. Additionally, it is competitively priced when compared to other pressure boosting alternatives. Note: A complete EZ Boost system consists of an EZ Boost pump with mounting brackets, EX Boost constant pressure system and a 2 gallon diaphragm tank. Grundfos three major product groups are circulator pumps (UP), submersible pumps (SP), and centrifugal pumps (CR). Today, Grundfos is the world's largest manufacturer of circulator pumps, covering approximately 50 per cent of the world market for these pumps.